Treasury Secretary Tim Geithner is pushing to let tax cuts expire for the "highest-earning Americans." Washington (CNN) -- The Obama administration will push for letting tax cuts for wealthy Americans expire while extending them for the rest of the nation, Treasury Secretary Tim Geithner said. In interviews broadcast Sunday on ABC and NBC, Geithner called for a balanced approach as the economy recovers from the recession that started in 2008 while facing mounting federal debt. That means pushing for measures designed to raise revenue, such as letting tax breaks from the Bush administration expire for families earning more than $250,000 a year while holding down spending and taking steps to encourage private sector job creation, Geithner said. "We're in a transition ... from the extraordinary actions the government had to take to break the back of this financial crisis to a recovery led by private demand," Geithner told the NBC program "Meet the Press". "That transition is well under way. It's going to continue and it's going to strengthen." Along with letting the tax cuts for the wealthy expire, the administration also wants to "leave in place tax cuts that are very important to incent businesses to hire new employees and to invest and expand in output," Geithner said on the ABC program "This Week." Republicans say letting tax cuts expire for wealther Americans will hurt economic growth as the nation recovers from the recession. In particular, GOP critics say the $250,000-a-year threshold means many small business owners would be included in the group seeing their tax burdens increase when the cuts expire at the end of 2010. "The safest thing for America would be to have a provision passed this fall that said no tax increase of any kind in 2011," former House Speaker Newt Gingrich, a possible Republican presidential candidate in 2012, said on the "FOX News Sunday" program. "Everywhere I go -- and I've been in 10 states in the last 14 days -- business people say to me over and over again, 'I will create no new jobs in this environment because the uncertainty is too frightening.' "
Geithner said the plan is to extend the tax cuts for more than 95 percent of country while letting them expire for about 3 percent, which he called the "highest-earning Americans." Asked on the ABC show if letting any tax cuts expire would harm the recovery, Geithner said: "I do not believe it will have a negative effect on growth." 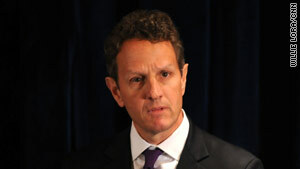 "We think that's the responsible thing to do," Geithner said. "We need to make sure we can show the world that we're willing as a country now to start to make some progress bringing down our long-term deficits." Video: Bush tax cuts: Time to expire? Video: Have Dems' econ policies failed? Overall, he said, the government was "making progress" in restoring private sector job growth. "I think the most likely thing is you see an economy that gradually strengthens over the next year or two," Geithner said on NBC. "You see job growth start to come back again; and again, investment expanding, manufacturing is getting a little stronger, exports better. Those are very encouraging signs. But we've got a long way to go still." President Barack Obama's poll numbers for his handling of the economy have dropped into unfavorable territory, and Republicans have hammered the administration over continuing high unemployment despite last year's $787 billion economic stimulus bill. Last week, the administration said it expects unemployment to remain above 9 percent through 2011. Geithner said the government is moving from the emergency steps enacted to deal with the recession -- such as bailing out big banks and automakers -- to more long-term approaches for helping the private sector create jobs. On NBC, he called completing projects under the stimulus bill and enacting proposals to help small businesses and teachers "sensible, good steps," adding that the main goal is to "make this transition to a recovery led by private companies." "We have to make some choices, too, and we have to make sure we can continue to earn confidence around the world that we're going to have the will as a country to bring these large inherited deficits down over time to a much more manageable level," Geithner said.